Deadpool 2's triumvirate of anti-heroes is complete. 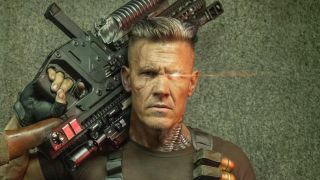 Ryan Reynolds hopped onto his Twitter account to casually share the first two pictures of Josh Brolin as time-traveling cyborg mercenary Cable, following up his reveal of Domino from last week. Glowing eye? Check. Giant gun? Check. Liefeld pouches? Check. Battered teddy bear? Che-whahuh? It could be some kind of weaponized plush ordnance system. But it's more likely another nod toward Hope, the prophesied mutant messiah whom Cable acts a surrogate father for in the comics. Hope's name was scrawled on the window of a phone booth in the Deadpool 2 teaser from Logan. Expect to hear more about her soon; we still don't know what Deadpool 2's actually about yet, after all. We've got more Deadpool 2 news all in one place for your easy perusal.